Ghost Cases: Sergeant Hutchings, I Presume? In 1942 a young Royal Air Force sergeant named Tom Hutchings was stationed near St. Andrew’s, New Brunswick, a small village near the border with Maine that looks like something straight out of a Stephen King novel. He left a dance one night with a pretty local girl named Bernice Connors who was found murdered the next day. Hutchings was convicted of the crime and hanged in December 1942. He spent his final days in a small, dark, cold cell in the jail, within earshot of where his executioners constructed the gallows. As a result, in February, 2009, Holly and I found ourselves in St. Andrew’s, sitting in the cell at the jail trying to make contact with Hutchings. Just for good measure, and on the theory of “in for a penny, in for a pound,” I came up with the bright idea of trying to antagonize the spirit of Hutchings by bringing along a noose that was on display at the jail as a “trigger” item. The old jail in St. Andrew’s, New Brunswick. 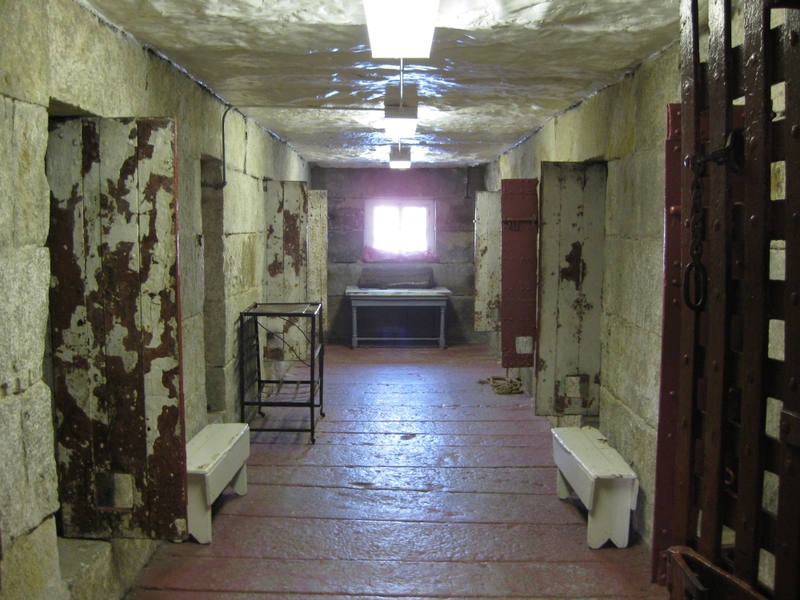 Hutchings’ cell is one the left at the end of the hall. For a laugh, as much to amuse Holly as anything else, I placed the noose around my neck as we were locked in the dark cell by the crew. Holly and I sat next to each other on the remains of Hutchings’ old bunk, with an EMF meter to Holly’s right, and out of my sight, as we waited to see what would happen. After almost thirty minutes Holly and I hadn’t experienced anything other than the winter cold and some pleasant conversation. It was at this point that I decided to turn off the low-level camera light we had set up in one corner of the cramped cell. I took the noose off my neck and plunged us into almost total darkness, with only the barest, almost imperceptible hint of moonlight coming through the slit of a window in the wall of the cell. Within minutes, I felt Holly shudder beside me. Holly is about as level-headed as they come, and definitely doesn’t frighten easily, so for her to utter a profanity out of the blue was an indication of just how shaken she was. I thought Holly had felt it too and that’s what she had caused her reaction, but she had actually experienced something completely different (which she thought I was reacting to). In her case she saw a black shape move in front of her, and felt a “presence.” Then she had looked to her right, and noticed that the EMF meter had spiked from zero to a full-on reading of activity.